Should You Use Done-For-You Products? 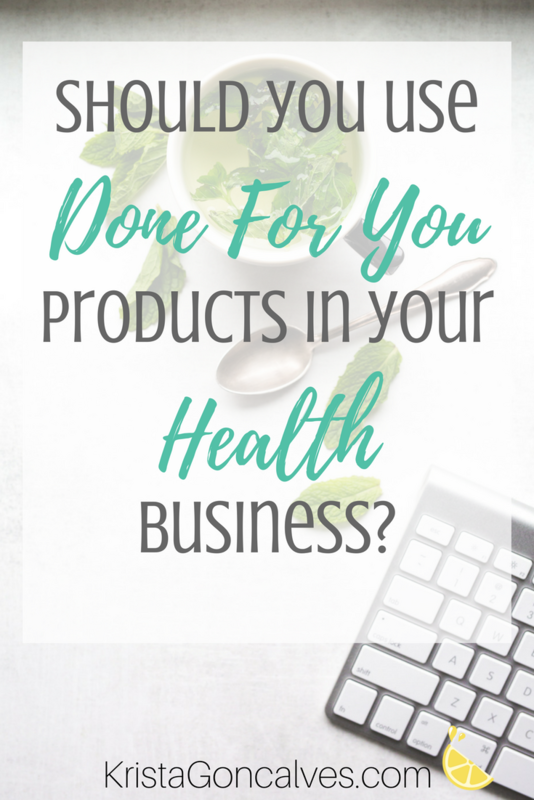 Should You Use “Done For You” Products in Your Health Business? You’re just getting started as a new Health Coach or Online Wellness Entrepreneur and your head is swimming with all the things. Getting clients, keeping clients and finding more clients. Your website, blogging, and creating content that your target audience actually wants. “Showing up” on your social media channels and coming up with engaging posts. Gaining subscribers, building your list and email marketing…and all the things seems to never end. With all that you need to do in your new business, the thought of having to spend even more time creating your own coaching program (even though you might not even have clients yet), well, it just adds to the deluge. So, using a “Done for You” (or DFY) health & wellness coaching resource or program can certainly be alluring when you’re navigating all of these business priorities. Here’s the exact question I received when a colleague asked me why I had stopped nutritional consulting and seemed to have switched to offering DFY products for other health pros. Why would people even want “Done For You” stuff for their business anyway? Don’t they want to use their own content and resources, so they can customize it and really target it to their own audience? SKIMMER’S NOTE: If you’re wondering why I’ve now trimmed down on offering DFY stuff (when I first thought that’s what I would specialize in), then watch the YouTube vlog of this post! Ideally, you want to create your own wellness coaching program to use with your clients – one that you feel holistically aligned with. But, does it really make sense to spend time (and money) creating your own program when you may not even have clients yet? That’s where DFY products can “hold you over” in your business, so to speak, especially when you’re just starting out, while you’re still developing your own customized and branded systems and methods. However, there’s so much more to it than just grabbing a DFY program, plugging it into your business, and getting started with it! 1/ It doesn’t tick all of your boxes. It’s very unlikely that any one DFY product or program will have everything you want or will align with your personal and business health systems and methods. Just be aware of that when looking at a program’s features and materials you’ll be getting. Have you used DFY products or programs – what is your experience with them? Check out the wide variety of insight from actual group members! 2/ Updating, customizing and personal touches. You will undoubtedly need to spend some time customizing — and you should do that anyway! It will likely be less time spent than creating it 100% yourself, but understand that there will still be an investment of time and energy. 3/ Marketing, promotion & selling still required. Budget some more time and energy here too, because you’ve still got to market and sell the thing before getting any clients or buyers for it. 4/ Take it on the run, baby. If you’re going to use a program with your clients (who you undoubtedly value and respect), you need to be 100% comfortable with the resources you’re offering to them. That’s why you’ll need to review all of the materials and take things for a test spin so you can feel really good about the program and, in a sense, take ownership of it. 5/ Re-seller? Has someone else created a DFY program, only to customize it and re-sell it as a DFY program to you? Say what?! You may never know if this is the case, so just always purchase from reputable and credible sources! “Being a web developer, I work with a lot of health and wellness practitioners who develop DFY programs for both clients and other practitioners, so I’m fortunate (maybe unfortunate!) to get a sneak peek of these programs from behind-the-scenes. And I can tell you, there are some really sub-standard products out there! And unfortunately, that means that a lot of unsuspecting people are paying for low-quality products. Often times these practitioners have purchased a DFY from a 3rd-party and have “repackaged it” to resell as their own DFY (sometimes without even customizing it to their own branding!) while others have taken the product and significantly modified the products to reflect their own approach. It’s rare you find DFY products that are done from scratch by the person selling them. Either way, I find it astonishing (and depressing) that people think it’s ok to sell low-quality programs to their clients. It’s really the equivalent of a car salesman trying to sell you a lemon car. Krista: hey, watch what you’re saying about lemons! Haha! This would apply to content that you’re publishing like a blog post – that’s why I’m not particularly a fan of purchasing or using DFY blog articles, and I actually withdrew all of the ones I had written and had for sale on my site after a colleague, who is an SEO specialist, recommended against selling them for this very reason! Even if you customize them, then publish, Google is way smarter than that and can spot similar content a mile away. So, that actually spins DFY in a positive light – which leads us to the benefits of using it! Ok, this post is not going to be all about peeing in your lemonade because there are definitely many benefits to purchasing and using DFY products IF you choose the right one! ✓ Less time & energy: as the name clearly indicates, the materials are done for you, so usually with some minimal changes and customization, you can get started working with clients right away – which is key when you’re just starting out. You really do just have to GET STARTED! “They (DFY products) can be great. Being a writer, I know there are some really high-quality ones out there. However, I would always recommend a bit of customization to tweak it to speak to your audience specifically. I’d consider them 75-80% done (you should always do a final edit), which is a huge timesaver, rather than starting from scratch. ✓ Less cost: when writing or content creation is simply not your thing, a DFY program may be just the ticket – especially if you don’t have the budget to hire someone to exclusively create the material for you, which would cost you far more than what the average DFY product costs. Ouchy! ✓ Ready-made digital marketing tools: many DFY programs also include marketing materials such as images or graphics, social media templates and even promotional copy to go with them. ✓ Recipes & meal ideas: clients loooooove fresh meal ideas, and there are often recipes included in a DFY coaching program. Plus, even if you’re pretty handy in the kitchen, creating recipes is probably not your gig, so again this would be a big time-saving bonus. THAT CLEAN LIFE FOR BUSINESS is the all-in-one recipe + meal planning software I wish I had when I still had my nutrition practice!! By the way, if you’re a classic skimmer like I am, and are only going to read THIS section – be sure to WATCH THE VIDEO! While the (over)abundance of DFY products hitting the online market has really gotten under my lemon peel lately – that doesn’t mean I’m trying to steer you entirely clear of them! DFY products… I have bought them, I have used them, and I also create them for other Health & Wellness Pros. 1. WHO your target audience is, i.e. be sure you’ve clearly defined that before you create ANY content or buy any from someone else. 3. Exactly HOW you’re planning to use it, e.g. delivery method, free or paid, which part of your sales funnel does it “function in”, etc. Understand that you will have to do some customization (and you always should!) before using it. Here are some DFY products & programs that cover all of the above bases, and that I recommend from trusted colleagues whom I have confidence they’ve done their homework and due diligence in creating top-notch stuff that has proven results! PLEASE NOTE: I would never recommend a product, program or service if I didn’t truly loooove it, seen it in action, and have great confidence in it. 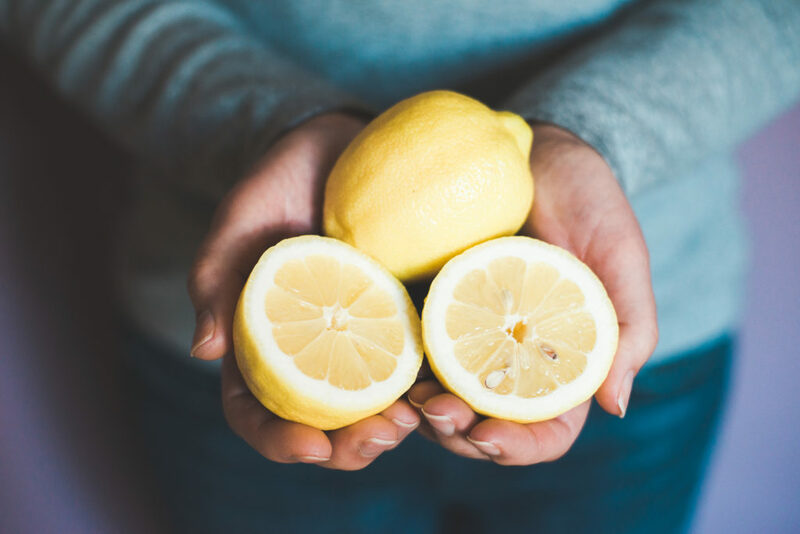 I’m simply not going to put something out there for you for the sake of a little kickback – that’s just not how we juice our lemons around here! Making Lemonade... where juicy brands are squeezed!